Chris Cuomo is co-anchor on “New Day” alongside Kate Bolduan and news anchor Michaela Pereira weekdays at 6am ET. When he's not busy reporting, he can typically be found out on the water fishing, working out at the gym and hanging with his family. Chris is also very passionate about "Good Stuff" news, stories out there of people helping others, showing kindness and acting heroically in big ways and small. We are always looking to feature videos and photography that highlight the "Good Stuff" going on in your world. So help us out! 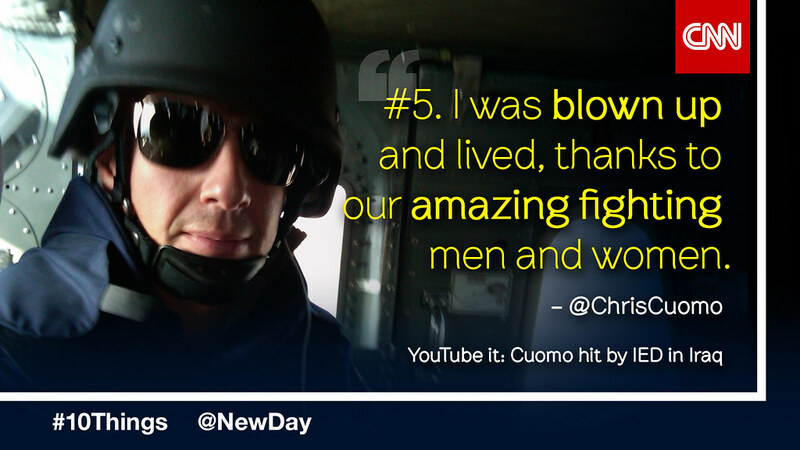 Leave a comment, post on Facebook, or tweet to@ChrisCuomo or @NewDay using #NewDay and submit your story on iReport. Love watching Chris and the New Day gang. Their chemistry on camera is great; and, I enjoy watching them daily. I'll bite....why were you in jail Chris?? ?